Home Safari Conservation Contraception or culling? Those making a killing from photo-tourism are long on Botswana boycott predictions but often short on balanced reporting or promulgating actual solutions. 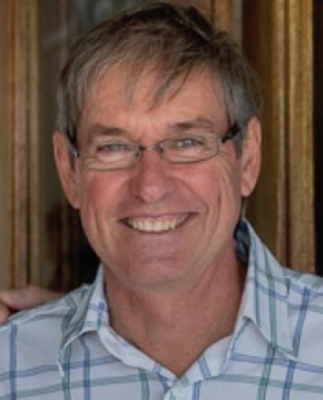 Questions about what happened to the annual R7 million promised to communities, and how much of the thousands of dollars made by high-end lodges actually reached the locals, are seldom addressed. Before the 2014 ban, trophy hunting brought in significant revenue and employment in harsh, remote areas, but despite promises from the luxury tourism industry, photographic safaris have not filled the void. Add a good dollop of political in-fighting to the mix, as two alpha stags – former president Ian Khama, who outlawed hunting, and current incumbent Mokgweetsi Masisi – lock horns. 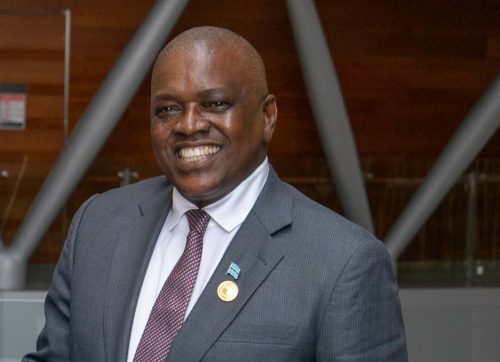 President Masisi’s rejection of ‘a surge in elephant poaching’ finding from Elephants Without Borders (EWB) as ‘lies’ plus his withdrawal of EWB’s wildlife research permit, only added sparks to dry savannah; a move Khama described as ‘spiteful’ (demonstrating) .. ‘an allergy and intolerance of criticism’. 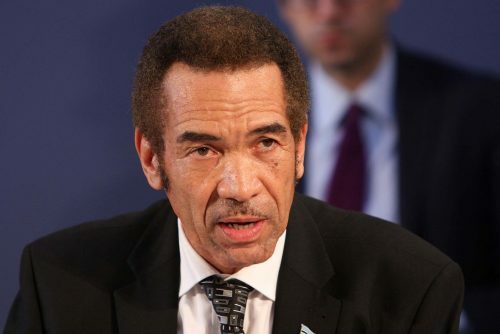 Former President of Botswana, Ian Khama, photographed in 2014 at the London Conference on The Illegal Wildlife Trade. 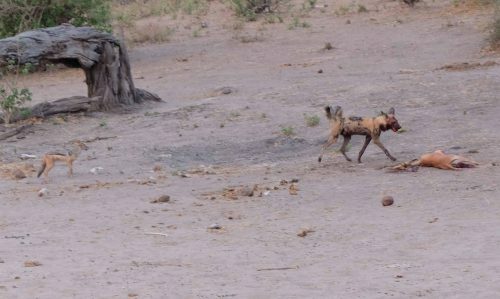 This image of a wild dog in Chobe shows some of the desertification in the area. Is elephant contraception the solution? Safari consultant Kevin Leo Smith is sceptical; pointing out that: “While effective in small fenced reserves, often these reserves go through management or money issues and then fall behind so most small fenced reserves now have too many elephant. “(Elephant contraception) involves being able dart every cow every year, which is just not affordable or logistically possible at scale. Some basic maths: A herd of 130,000 or so approx 50% female with 75% breeding age = R170m for the first year (at your lowest cost) and then R85m in perpetuity; not to mention the logistics of covering something like 12 million hectares. Let’s be real – raise the capital to fund this in perpetuity then come back and talk – at 7.5% RoI that means you will need to have raised R1.6 billion before anyone can consider this idea fully funded! 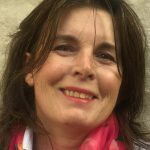 However, Audrey Delsink, elephant contraception pioneer, who has been in the forefront of immunocontraception for 20 years, with Makalali being the benchmark project, dismisses Leo Smith’s comments as ‘outdated and flawed’, reminding those critical of immunocontraception to ‘compare apples with apples’. “More than 850 females in 27 reserves across South Africa are on immunocontraception treatment. A female is capable of producing 8-10 calves in her lifetime; thus the exponential effects are extraordinary,. Citing the 2008 Elephant Assessment book, the Wildlife Director of Humane Society International (HSI) Africa says: “The cost of culling was ZAR8,000/elephant (but) is now likely to be much higher. In contrast, contraception is approximately ZAR1500 – ZAR2000 per elephant, inclusive of the darts, vaccine and chopper time. Of course, the more elephants that are treated, the more the costs are diluted. “Some of the reserves under treatment (many in their 11th year) include private, provincial and national parks. While HSI supports some EKZN provincial reserves, all other reserves cover their own costs. “The results speak for themselves. Managers would clearly not invest in this pro-active, long-term approach if it were not ‘vaguely affordable or logistically possible’. “While the vaccine indeed causes an immune response, this is done at a protein level. Simply put, the vaccine prevents the sperm from fertilising the egg so conception does not occur. 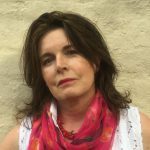 Leo Smith’s reference to ‘an embryo implanting into the uterine wall and forming a placenta’ is incorrect and demonstrates his lack of understanding of the immunocontraceptive process. “As a result of this immune response, treated females do need an annual booster to maintain the contraceptive effect. We have done this successfully for two decades in South Africa, including the almost 100,000 ha Hluhluwe iMfolozi Game Reserve. “And even though these reserves are fenced-in, elephants have a high fidelity to their home ranges and it has been demonstrated that even in these enclosed systems, elephants have definite summer and winter range areas. Thus, it is possible to vaccinate elephants based on known home ranges within the dry season period. It is simply a matter of upscaling the resources and understanding the elephants ranging behaviours. 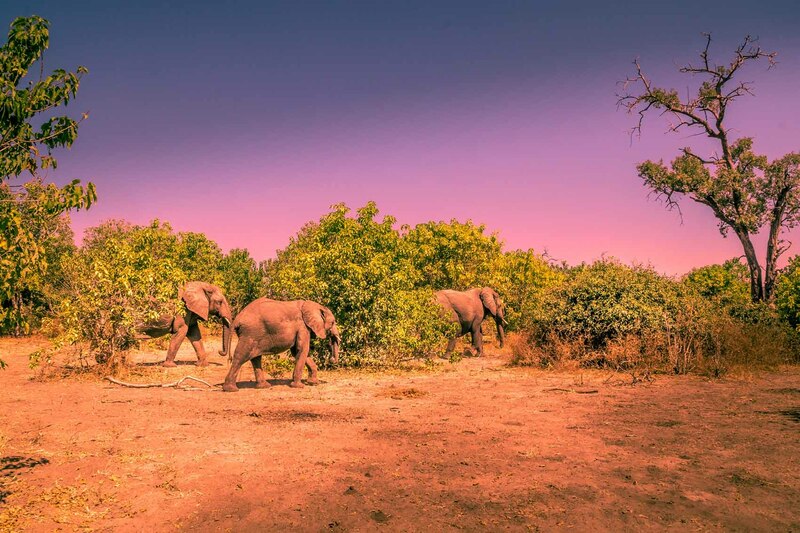 “Many reserves, including Kruger, have identified specific ‘areas of concern or risk’ where focus is on managing the effects of elephants on their habitats. Ecosystems remain in flux and true adaptive management is embracing this, moving away from management based on absolute numbers. Thus, contraception applied in areas of concern, based on the elephants’ biology of spatial and temporal range use, is feasible and possible. This dispels the notion of having to contracept an index of the entire population. 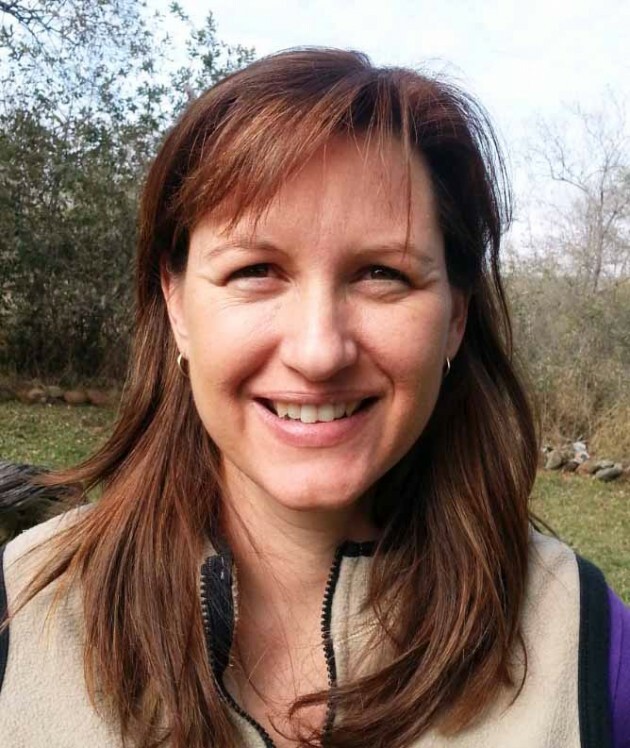 “Immunocontraception should be included as part of a reserve’s species management, especially those that cite ecotourism as one of their main objectives. “Culling has long been controversial issue, and the more we learn about elephants, the more this management tool is not accepted. “Surveys prove that by far the majority of tourists prefer tour companies with responsible wildlife policies, that ethical travel is on the rise, and … travellers .. experience “travel guilt.” (from certain) … animal interaction activities. “I wager that people would prefer to travel to a reserve that practices a humane, effective, non-lethal alternative to elephant management than culling. Thus, while it’s true some costs could be recovered from the ‘products’ derived from elephant culls (in line with CITES), the loss in tourism revenue and brand reputation are important considerations. “The vaccine is currently derived from pigs slaughtered for human consumption, so supply is not an issue. However, field trials in the research and development of alternative sources for synthetic vaccines are underway. It is only a matter of time before the vaccine is no longer made from porcine ovaries. “The culling vs contraception debate will likely continue relentlessly. However, with 20 years of intensive research (including the KNP trials) into immunocontraception examining efficacy, effects on biology, physiology, behaviour and herd dynamics, we have done our due diligence. However, responding to Delsink’s remarks, Leo Smith said: ”Trying to depreciate my main point on basis of the mechanism of immune response is displacement activity. Audrey did not deal with my main point, ergo: show me the R1.6 billion, then contraceptions becomes an option. She needs to explain how this gets funded at scale. It appears to me that the 12 m ha extent is also something that is being ignored. How would one get fuel to choppers in this remote area for example?